The routine menu in my house is usually very straightforward and I like to keep it tailored in a way to meet accepted nutritional requirements of my family. At 3 years, I don’t hand over a knife to Little A, yet he is of a great help to assist me in assembling, filling, mixing and arranging the food and ingredients on my instructions and guidance. It becomes easier for us to prepare meal in a flash when two of us get together in the kitchen, stirring pots and pans and making enduring memories. You won’t have to look for recipes that are suited for children specifically, although that could be beneficial but on most days we don’t. I have him seated in the kitchen and ask him to do small bits and don’t ever feel guilty again of not spending enough time with him since he spends most of his morning hours in a nursery. Little A contribute to our usual meals in any small way possible and we then celebrate our achievement together on a dining table sharing a meal laughing over the mess, achievement and debacle we just created in other part of our home. It improves our bonding and teach him a lot about the many vegetables and fruits we eat everyday. 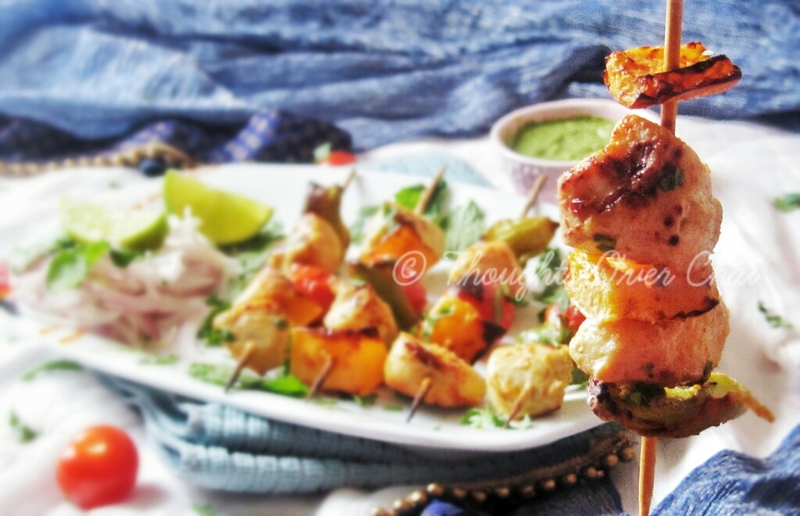 Every Indian household has their own recipe for Chicken Tikkas – adjusting to the spices and flavors each desire. Growing up, we saw many get togethers hosted at our home and Tikka Masala would most necessarily make its presence felt. It is one particular dish I wouldn’t tire cooking and eating because of succulent Indian flavors it carries. 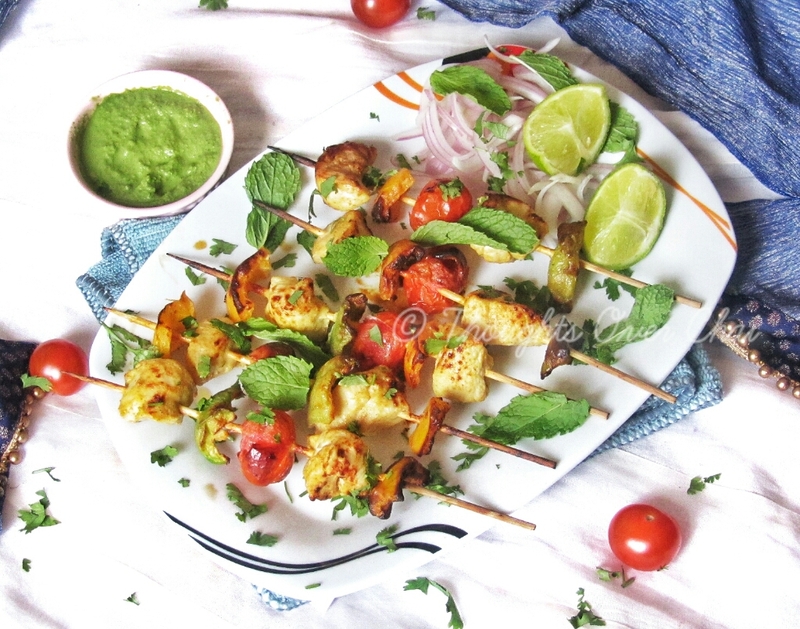 Traditionally it is cooked in tandoor for the charred flavors or grilled over hot coals at barbecues; but it isn’t really necessary for me for regular dinners and makes our meal come together very quickly. This time around, I used Philips Air Fryer as a part of #30daysofhomemade to make chicken tikkas and couldn’t believe how perfect it came out- minus the mess and long wait of having them cooked in an oven. What I specifically loved about using Air Fryer for this recipe is that it left the charred marks on the chicken and peppers and grilled them just as effectively as it would in a traditional manner. And the chicken was still juicy! 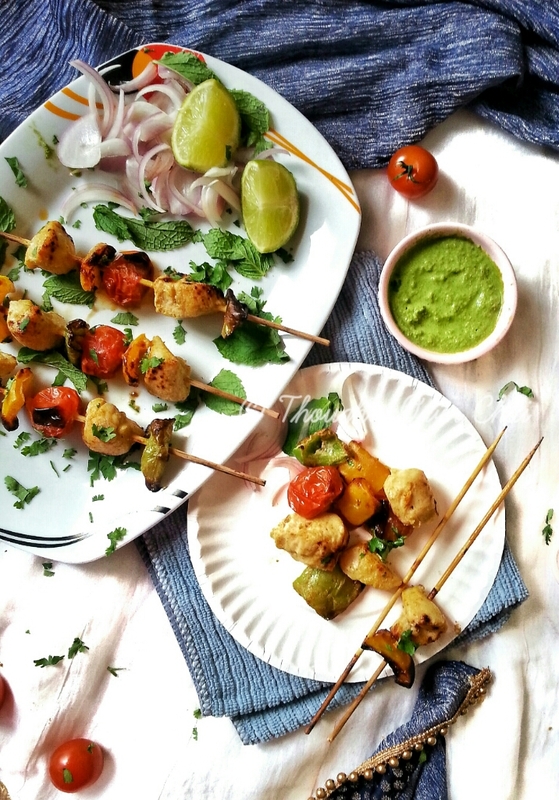 This is another great recipe where children can help you with threading the meat and vegetables on the skewers, however, should be done under supervision, especially with small children around. The flesh of the chicken isn’t very tough so it is easier for them to push through a skewer without putting in too much effort. It is very exciting for the little ones, mine included! And it is yet another dish that can work in a jiffy for working mothers or if you are in a hurry. Just marinate the chicken well before leaving home and your dinner will work out in less than 15 minutes. Boneless Chicken – 500 gms, cut into bite sized pieces. Bell peppers – 3 (any color of your choice), cut in an inch chunks. In a large bowl, mix together all the ingredients under marinade and coat the chicken well with spices. Cover and let it sit for 2 hours. If possible, overnight. Ask your children to help you in threading the chicken, tomatoes and peppers alternatively on the skewers and keep them ready. Preheat Philips Air Fryer for 5 minutes at 200 Degrees C.
Line the basket with aluminum foil and place the skewers. Grill for 12-15 minutes, turning each skewer once in between so it cooks evenly. Remove in a plate. Garnish with coriander, mint, onions and squeeze a lime before serving.